A sunny spring day on a Greek island. Flowers blossoming all around, their sense blending with the light sea breeze reaching the whitewashed villages up in the mountains. A warm feeling surrounding us as we walk through the narrow alleys, touching the bare stone of centuries-old houses and stables. A donkey is heard from the other side of the valley, its cry echoing far away. It’s beautiful, it’s peaceful. A bunch of bulky old keys clings in the hands before opening the wooden door. 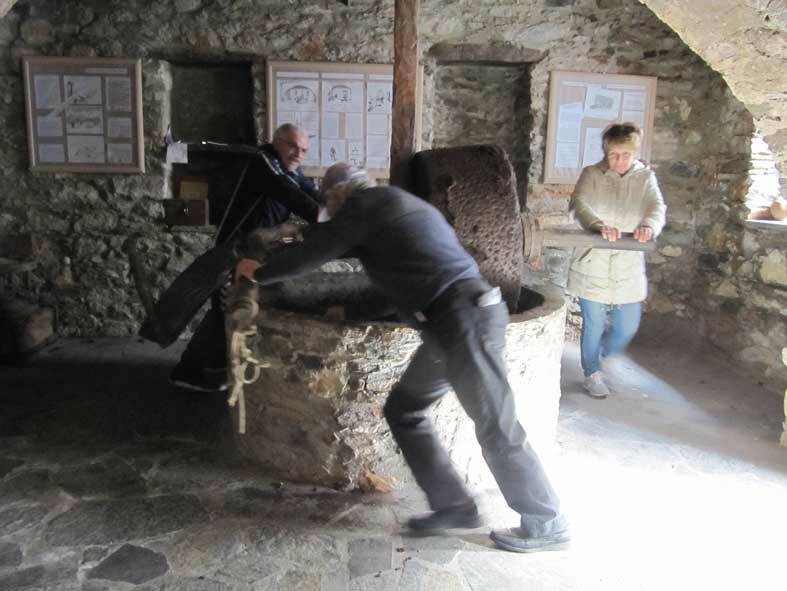 A creaky sound and there it is: the old olive press is there standing, a solid reminder of human labour and times past. From the outside, you could easily mistake this humble old stone building for a simple home or even a stable. This isn’t any industrial structure, unlike its modern descendants. Four thick stone walls around and the traditional supporting arch in the middle, separating the space in two and supporting the roof at the same time. 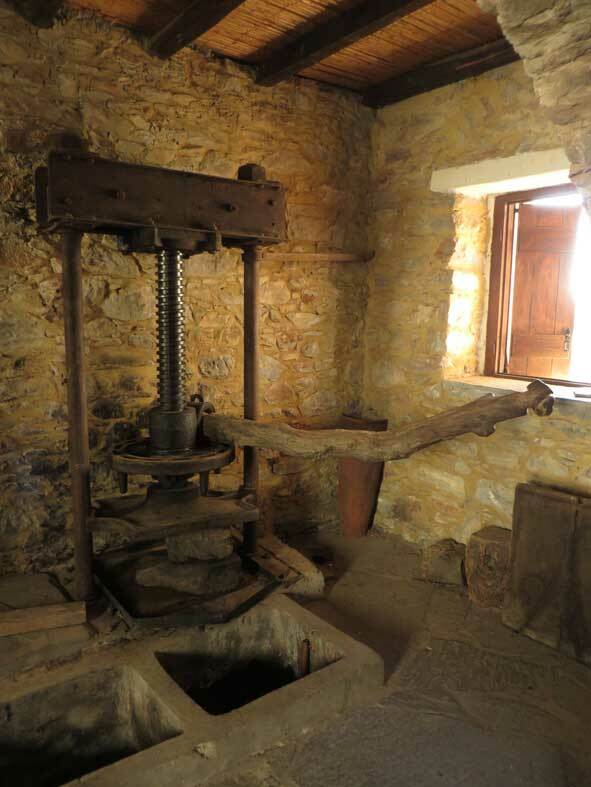 Traditional olive presses in Greece stopped functioning some decades ago, being replaced by modern, mechanized presses at different times depending on the location or the island. The new technology was immediately embraced with relief, leaving the old buildings almost totally abandoned, at the best being used simply as storage spaces. People were happy to move ahead and forget the long winter days of intense, hard manual work, the rainy nights carrying sacks of olives up and down the village. Looking at the traditional olive press today and listening to the stories of men working in it, it isn’t hard to understand why the shift was so quick and left no time to look back. It is hardly imaginable for younger generations of Greeks today, who use olive oil with so much ease and in such quantities, to understand the labour their forefathers needed to produce this precious liquid. Only when you step in these old structures, with their bare ground and slight lighting, the bulky stone mills and metal press, only then it all starts making sense. 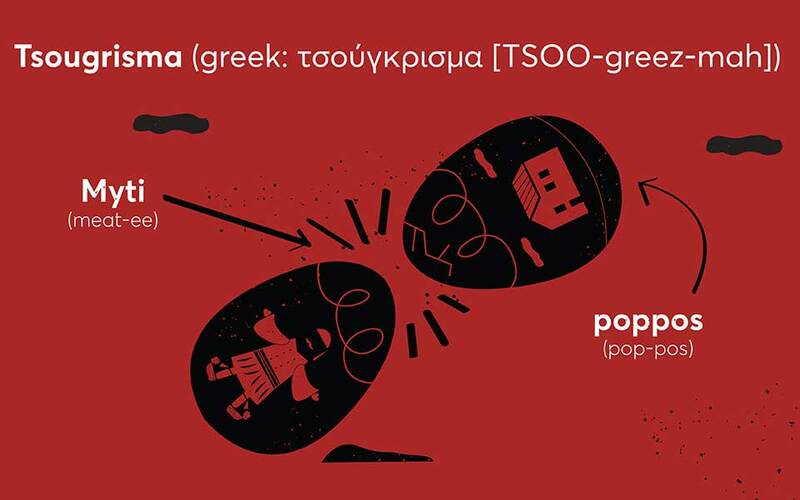 Olives and olive oil have long been some of the main products of Greece and a basic element in Greek diet, no matter how poor people may have been or what other means of survival they had. The annual olive picking season would typically take place in autumn, with the whole family taking part in the activity, carefully hand picking olives from the trees. Later, assisting tools were introduced, like the special fork that combs branches, dropping olives to the cloth spread underneath. The olive picking procedure has largely remained the same until today, especially in smaller, more remote places such as the islands, and autumn is still greatly marked by the olive picking season. 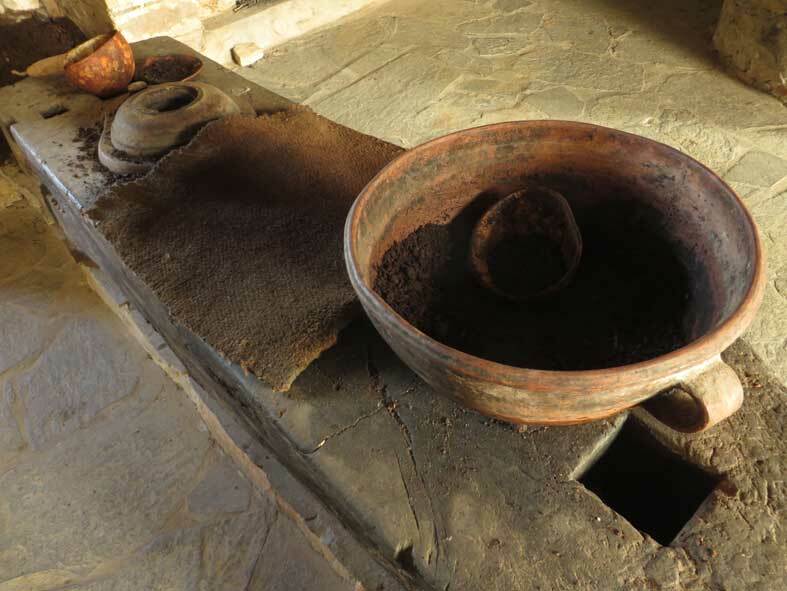 Given the importance of olive oil, it is no wonder that even the smallest village used to have an olive press, with most villages on the Greek islands having 3 of them or more. These were what we would call today “private enterprises”, with the owner providing the facility to other villagers in exchange for a fee –traditionally 1/10 of the olive oil produced. Once olives were collected and put in sacks in the field, they were carried on the back of humans, donkeys or mules to the olive press. Depending on the size of the facility, three to six people would be working there almost round the clock, each one in charge of different duties. It was hard work –but rewarded with such a precious resource that it was considered good fortune to be hired in the press. There are anecdotal stories of men using family ties or other connections to find their way to a working spot in the press. Times were truly different. Several duties were necessary to be constantly well operating in order to ensure production. Early at dawn, the fire should be lit at the corner, which meant bringing wood, lighting it and keeping it burning. The fire would be burning as long as the press would be functioning, heating up water to be used at the press. Olives would be spread on the mill table. 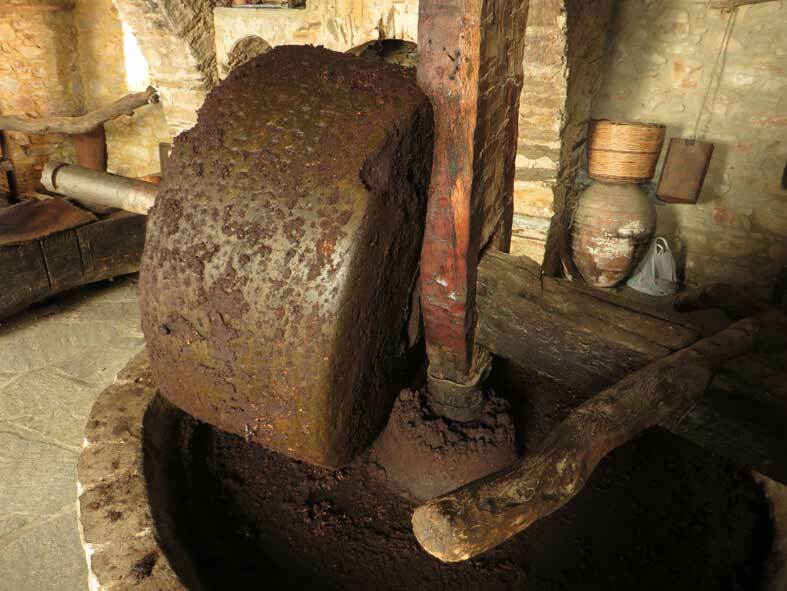 Men or donkeys would then push the large wooden handles that would put the mill stones in motion, pressing the olives and turning them into paste. 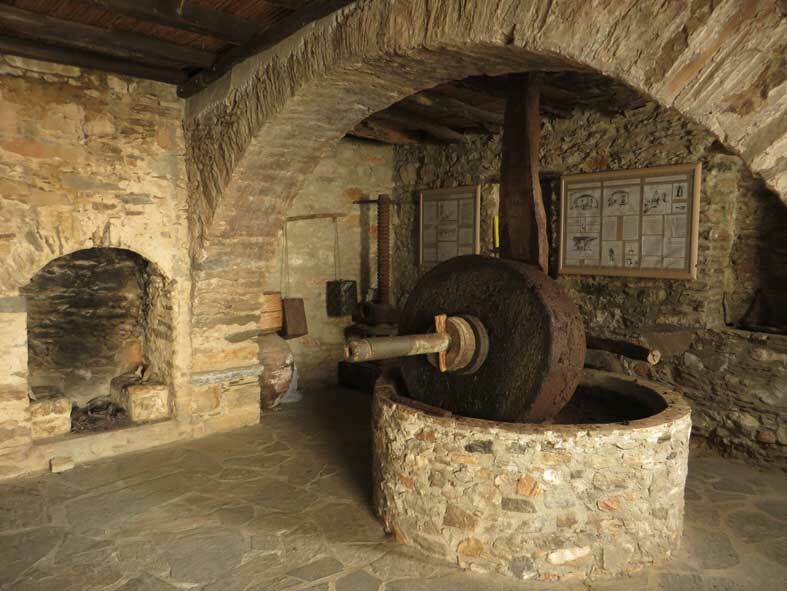 A worker would be following the movement of the mill cylinders, holding a wooden pan to bring back the olives and paste towards the table, counteracting the centrifugal motion. Round and round the mill would turn, with 3 or 4 men or an animal painstakingly pushing the handles. 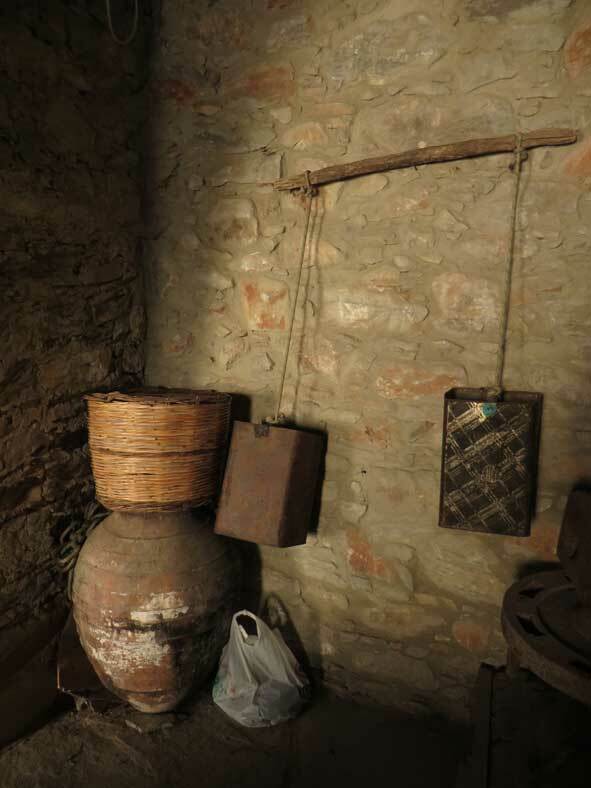 Once olives were transformed into paste, they were set into bags made of cloth. More than bags, these elements looked more like huge envelopes. The paste was distributed horizontally on the cloth surface, which was then closed by carefully picking all four corners. The thinner the paste layer, the better, and it was a privilege for a press to be known for the worker’s ability to give the paste layer the ideal thickness. Cloth bags were then stacked one upon the other at the press. These were bulky structures, typical designs of the 19th century industrial era. Usually made of steel, their vertical axe would be released, allowing the bags to be placed between the pressing surfaces. Once the gap was filled, men would push the wooden handle that turned the vertical axis downwards, pressing the stack of bags. Again and again, this repeated movement created a rhythmical sound effect, the heavy breaths of men mixing with the metallic sound of the pressing axis being fixed and released. Steadily, the paste of the bags would come out as a golden-green liquid, falling in the pool in front of the press. The degree of pressure needed was such that once the handle could seemingly move no further, it was tied to a turning pole where 2, 3 or 4 men would combine their force to squeeze the bags even further. Olive oil was mixed with warm water in the pool in front of the press, from where it was collected and put into storage pots. As oil would be concentrated on the surface, water would remain at the bottom, from where it would be pumped away through a waste channel. 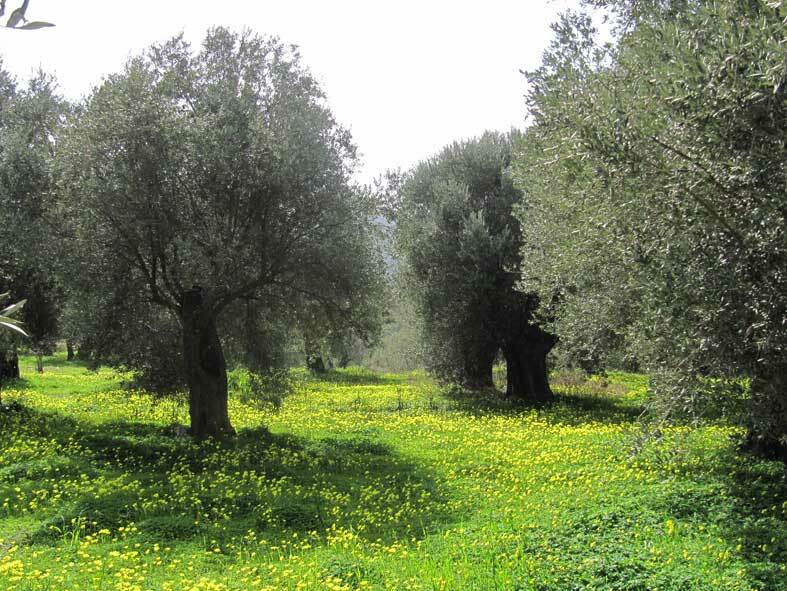 Once produced and collected, olive oil would then be distributed to the people involved: the producer, the owner of the press and the workers. As simple as it may sound, division was an elaborate process and in some places, specific calculations had been developed. Through narration perhaps the labour of pressing olives still doesn’t sound far from what we would expect or even compare with today’s standards. But the sensation of being inside a traditional olive press today, surrounded by its simple yet impressive equipment, thinking of the endless hours of work that took place here in the past, the cold, the rain, the physical activity involved, the small production… It is a humbling experience and one that can only fill us with love and a warm wave of deep appreciation for all the generations of simple people that performed the same painstaking ritual every autumn. But for all the comfort and ease we have gained in having our olive oil at hand on our table today, one thing has been lost forever: the joy of being together, of working with each other for a common good, the collective effort that every autumn would remind people of their common interest. And along with it, the stories and laughters shared in the evenings while sitting around the burning fire, a farewell to summer and welcome to winter. Where the technicolor, somewhat debauched Carnival ends, the 40-day religious fast, or nisteia begins. When strictly observed, the basically vegan diet forbids the consumption of olive oil on Wednesdays and Fridays and all animal products (apart from shellfish) throughout. The fast concludes in the early hours of Easter Sunday, when humble lentils, grains and the like are replaced by shiny red eggs and creamy offal soup. Nisteia is observed several times in the Greek Orthodox calendar, however the 40 day period leading up to Easter is by far the longest and strictest. Megali Evdomada or Holy Week is the seven days leading up to Kyriaki Tou Pascha, or Easter Sunday. Pascha is Greece’s most momentous holiday, equivalent to Christmas in the UK or US, as it honors the divine triumph of Christ over death and earthly suffering. For the devout, the week preceding it is filled with religious services in church and time-honored traditions at home. Many of the foods enjoyed on Easter Sunday are prepared during this week – koulouraki biscuits are made on Holy Tuesday, Easter eggs are dyed red (to symbolize the blood of Christ) and tsoureki (a sweet bread) is prepared on Holy Thursday. Celebrating the beginning of Lent and the upcoming change of seasons, Carnival has always been a major moment in the Greek calendar. Marked by wild, colourful festivities, it has given the chance to Greeks to enjoy limitless fun in a row of celebrations where seemingly nothing is prohibited, an opportunity to freely escape the daily harsh routine. Carnival traces its roots to the ancient cult of Dionysus (Bacchus), god of wine and theatre, and Christianity silently incorporated the dominant celebrations in the religious calendar, as a last wild enactment before the pious 40-day fast and preparation for Easter. The vast variety of the Greek landscape and its traditions means that the Carnival Weekend offers endless options for fun and unique celebrations all over the country. The main concept of a street procession, often combined with rural, animal elements, can be found in numerous varieties from the most remote mountain villages of mainland Greece to coastal urban centres. The Greek islands, both isolated and in connection with surrounding lands, have developed their own special festivities, which usually take place under the warm spring sun, a call for the upcoming summer. The easternmost of the Cyclades group, well off the main communication routes for centuries in the past, Amorgos hosts its own, peculiar Carnival customs, unlike any other of its neighbouring islands. During the three weeks of Carnival, groups of “Maskaroi” (disguised people) roam around the villages, marking their presence with improvised loud sounds and teasing fellow villagers. Maskaroi are disguised tip-to-toe in such a way that they cannot be recognized, and so they enter homes, cafés and restaurants, where they are welcomed with a shot of “raki” (local spirit) while the owners try to guess who they are. As the weeks go past, more and more groups of Maskaroi can be seen in the evenings and even once the Carnival is over, they keep their secret and never reveal to others who they were. Carnival Sunday is a special day for the villages of Aegiali. “Kapetanios” (literally meaning captain, chief), a custom traced back to the days of Turkish occupation, has been revived during the last years, bringing together all inhabitants and visitors. At noon, the men of the village head to the church on the hill across, singing to the local sound of violin and oud. Once at the church, the “Kapetanios” is chosen among the young unmarried men of the village. The celebration continues as he and his accompanying “Bairachtaris” (man carrying the leading pole) are groomed by fellow villagers. Kapetanios then rides the horse and follows his Bairachtaris, holding a pole on the top of which there is a loaf of bread, cheese and an octopus. The procession heads back to village, at the entrance of which the local young women await to join the party. Men and women then walk along the alleys, singing together and sharing shots of “raki” from the shop and café owners welcoming them. Once back at the main square, the Kapetanios shows his abilities riding the horse, before getting off, dancing with his companions and then choosing his “Kapetanissa” among the girls of the village. The couple shares a first dance before being accompanied by the rest of the village to a feast that goes on until well after midnight. “Kathara Deftera” (Clean Monday) is a day of joy and more tranquil celebrations. As in the rest of Greece, locals head for the nearby beach in the morning, where they fly colourful kites to the sky. At noon, they gather in the village centre to share the traditional meal of the day: “lagana” (traditional flatbread, originally prepared without yeast), “taramosalata” (Greek caviar paste), seafood, beans and other fasting delicacies. Considered as the island of Dionysus since antiquity, it is no surprise that Naxos hosts perhaps the most impressive and rich Carnival Weekend of the whole Cyclades group. Celebrations begin the week prior to Carnival Weekend and each of its villages holds its own colourful and loud traditions. “Kordelatoi” and “Foustanelatoi” (men wearing the traditional “foustanela”, a kind of Greek kilt, adorned with colourful stripes), go from one village to another in order to dance with local women. Every day up to Carnival Sunday is assigned to one or more villages and the meetings conclude to fun, music and dance. In the capital, Chora, celebrations begin on Friday night at the port, where the enactment of a story from the ancient Greek mythology takes place below the impressive setting of Portara. Usually related to Dionysus, this year the play revived the story of Poseidon, god of the sea, and the sea nymph Ampitrite. The show ends with a feast with music and wine where participants and spectators are invited to the fun. On Saturday night, the impressive “Lampadiforia” (torch procession) dominates the town, as hundreds of white dressed people descend from the castle down to the port holding lit torches to the beat of drums and bells. The long procession passes by the neighbourhoods of Chora as it carries the Carnival King (leading cart) towards the main square, where hours of music and dance will close the celebration. At the back end of the procession, the evil scare crow follows, which is burnt upon arrival at the main square at the port as men jump across its flaming body. Carnival Sunday is particularly special in the villages of Naxos. Perhaps the most famous of celebrations, “Koudounatoi”, takes place in the mountain village of Apiranthos. The rituals related to Koudounatoi are traced back in antiquity and are directly related to ancient celebrations in honour of god Dionysus. Men covered with the traditional coat wear a belt with hanging bells and walk along the streets and main square of the village. Their dancing movement makes the bells create a very loud sound in order to clear away the bad spirits. Holding large sticks that symbolize the Dionysian phallus, Koudounatoi challenge each other and anyone who interacts with them as they run across the cobbled streets. The feast continues with traditional dance and live music to the sound of “tsabouna” (Greek bagpipe), following the enactment of a wedding that takes place in the main square. On Clean Monday, kites are flown in the sky, especially in the area of Agia Anna, a popular summer resort close to Chora, where restaurants and bars open again after a calm winter. “Koudounatoi” in Apiranthos intimidating fellow men with their sticks. The impressive “Lampadiforia” at Chora, Naxos.